All messages are kept for a certain period and after that they are deleted. If you are a Bulfleet General, your messages are kept for 72 hours and you have access to all messages (Pic. 2). The non-general users have their messages kept for 24 hours and they have access to the first page only. There are 10 messages per page and upon deletion of one the 11th appears. 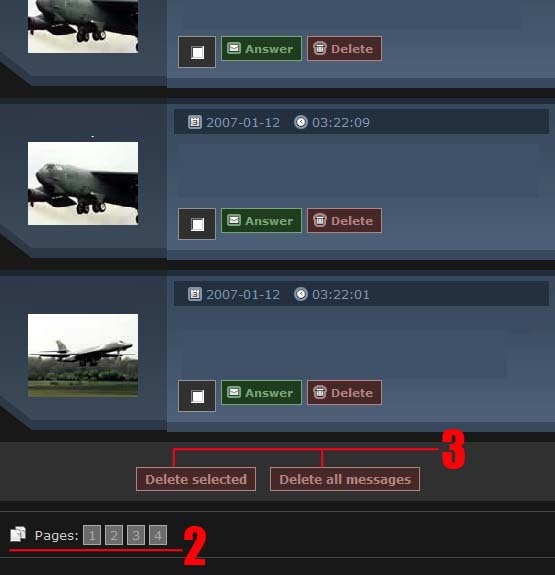 You can select and delete more than one message (Pic. 3). Messages, received from other players and the Game staff.. Messages, related to your personal and alliance relations and policy. Messages, containing information about the planets you have spied and the players, who had spied your planets. Messages, containing information about all battles, led by you with information about the resources you had stolen from other player’s planets and also the same information when you were in the role of the defender. Messages, containing information about your fleets, returning from mission, Recycle and Astroploatation reports.